The trip provides breathtaking views of the Matterhorn; the Eiger, Mönch, and Jungfrau trio; and the Aletsch Glacier peaks in the flight’s one hour duration. 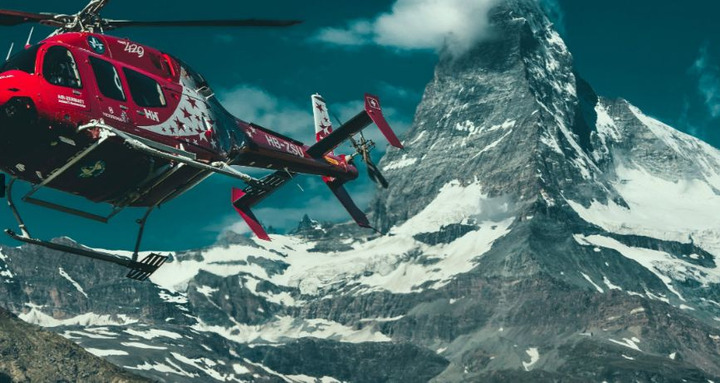 Hertz Switzerland and Swiss helicopter company Air Zermatt have teamed to provide Hertz car rental customers the opportunity to enjoy helicopter sightseeing tours at special rates. This includes the helicopter flight named "Hertz Prestige Collection" by Air Zermatt in honor of the new partnership with Hertz. The trip provides breathtaking views of the Matterhorn; the Eiger, Mönch, and Jungfrau trio; and the Aletsch Glacier peaks in the flight’s one hour duration. Available to Hertz customers who pick up their rental car in Switzerland, the helicopter tour rates are discounted by 10% or more according to the season. The partnership coincides with both companies celebrating respective milestone anniversaries: Air Zermatt its 50th and Hertz its 100th. The collaboration has also led to Hertz Switzerland and Volvo Cars Switzerland providing the Air Zermatt team with easy access to Volvo cars for company use in a multi-month rental arrangement.